Come into the garden! Bring your picnic blankets and some vegetables for a snack. But watch out—you don’t want Farmer McGregor to catch you stealing his precious carrots! Open up Beatrix Potter’s stories, drawings, and nursery rhymes and enter the beautiful world of Peter Rabbit. Beatrix Potter is the beloved author and illustrator of the Peter Rabbit stories, as well as many short nursery rhymes for children. Her cottage in the Lake District, England provided the inspiration for many of her drawings. If you visit today, you can still see the same furniture and views of the garden that she used in her beautiful watercolor illustrations. Did you know that Beatrix Potter was not only a writer and illustrator but also a scientist? She carefully observed nature around her and developed a theory on the germination of fungus spores. Her drawings are still being used to identify certain types of fungi. At age fourteen, she also created a code for recording her journal entries, which took Leslie Linder thirteen years to decode and transcribe. 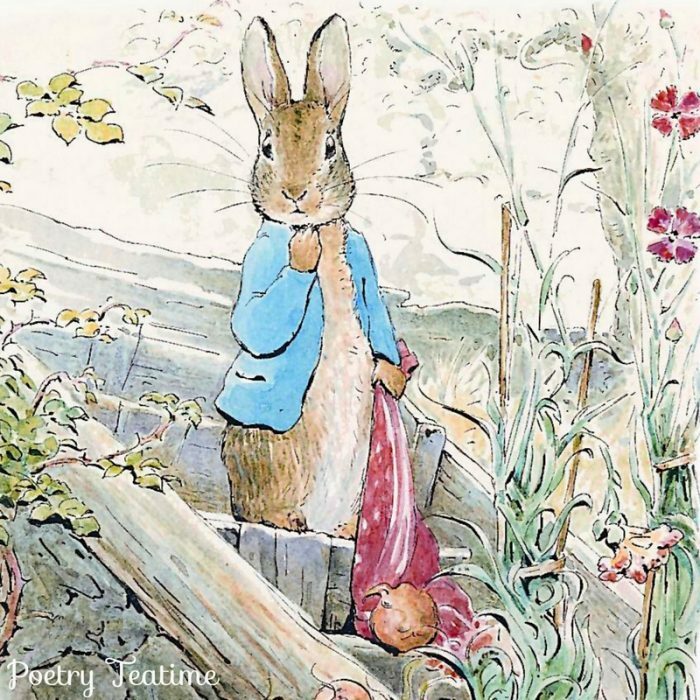 Even more amazing, when Beatrix Potter tried to publish her first Peter Rabbit story, it was rejected by publishers! Refusing to give up on the story, she decided to self-publish the book for family and friends. The next year, one of the publishers who had rejected the book at first agreed to publish it with her illustrations, and it was an immediate bestseller. 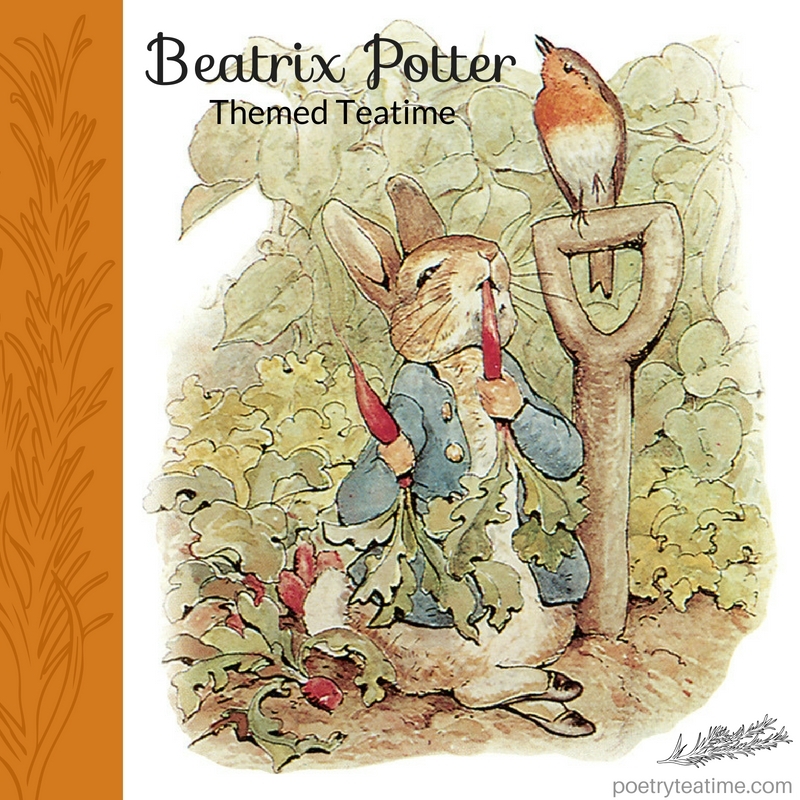 Let’s begin today’s teatime by sitting down outside in the fresh air and reading one of Beatrix Potter’s rhymes. Now that we’ve joined Beatrix Potter in the garden, it’s time to enjoy some tasty morsels, fun games, and, of course, garden-themed poetry! Cucumber sandwiches: What’s a teatime without finger sandwiches? These treats from Feast of Starlight are a great way to add a special touch to your teatime. McGregor’s Garden: Chop up veggies and grab some dip. Put up a few signs saying “No Rabbits Allowed!” If you’re up for a game, assign one person (or take turns) to be Farmer McGregor. Every so often, McGregor leaves the table and shouts, “I’m coming to the garden!” While he’s away, everyone needs to eat what’s on their plate. If any food is left by the time McGregor returns, they’re out! A splash in the pond: Chances are, it’s hot outside, and everyone’s craving a cool drink! For an easy refresher, add some slices of cucumbers, oranges, and lemons to a pitcher of water. Beatrix Potter carrot cake: For a simple and delicious carrot cake, check out this recipe from the Inspired Taste. Find more Peter Rabbit-themed recipes here from the Happy Foodie. Farmer’s market basket: The decorations for a Peter Rabbit-themed teatime can be as simple as you’d like. If you have a basket or a watering can, you’ve already got some of the main elements of Beatrix Potter’s illustrations! Fill the basket with the vegetables you’ve got on hand. Beatrix Potter treasure hunt: Have each person take one of Beatrix Potter’s books. Then, use the illustrations and try to find items around the house that match. Whoever gets the most items or the items that look most similar wins! Be sure to display the objects you’ve found as a centerpiece for the table, and pull them out when you’re reading that particular story or poem! 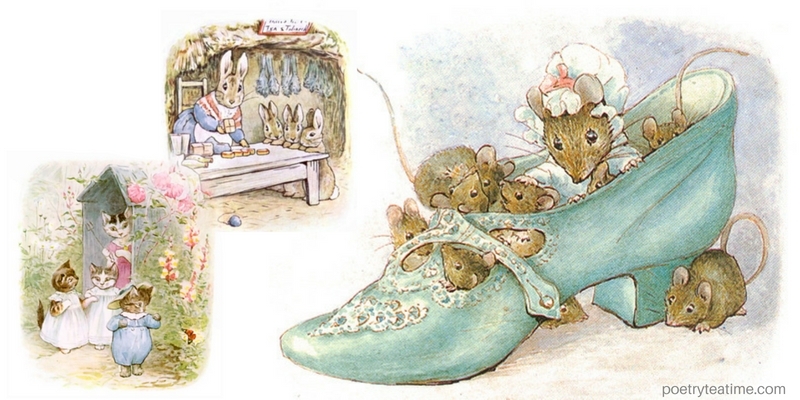 History, Art, & Nature Lessons with Beatrix Potter: Although it’s fun to read Beatrix Potter’s stories and poems, there’s so much to learn from her art, Victorian culture, and careful study of nature! Check out this wonderful guide from Heather at Blog, She Wrote for lots of ideas and resources on extending your study of Beatrix to history, art, and culture. Peter Rabbit art and coloring pages: If you have younger children, these coloring pages are lots of fun and easy to complete! Check out the full list here on Educational Coloring Pages. If you’re ready for more advanced art, check out this guide on botanical illustration from Blog, She Wrote. Take a nature walk and draw what you see. If you're feeling especially inspired, come up with a story about the plants and animals around you! So enjoy your treats and Peter Rabbit-inspired activities in today's teatime! Be sure to share photos and stories with us here.